An instrument that enables consumers to become the co-owners of the good they consume without own financial contribution is the so-called Consumer Stock Ownership Plan (CSOP). It was created in 1960s by American attorney and investment banker Louis O. Kelso, among other tools for citizens’ financial participation without own capital. The first and, so far, the only implemented CSOP project was in the year 1958 in Fresno California. The local farmers- the main consumers of a fertilizer- became in the framework of CSOP owners of the fertilizer producer “Valley Nitrogen Producers Inc.” The venture turned out to be so successful that the competitors (big oil companies) had blocked its further development. CSOPs are designed particularly for regulated markets with guaranteed prices, regulated market access and long-term relationships between producer and consumer. Renewable energy plants (e.g. solar panels, wind turbines, biogas reactors) are especially predestined, as the necessary investment is relatively small. Using capital credit to invest in power plants, consumers become (co-)owners, hence (co-)producers of energy. The acquisition loan is repaid from revenues from the sale of the surplus energy production to the grid. Guaranteed feed-in-tariffs enable particularly favourable credit conditions. Citizens thus pay for newly acquired capital out of its future earnings. In result consumers win free of charge or cheaper electricity, and additional income. The shares are entrusted to the consumer-beneficiaries in proportion to their respective energy purchase from the utility and paid out as dividends, but only once the acquisition loan is repaid profits are paid out as dividends. g) After the repayment of the capital acquisition loan profits from the power plant are paid to the consumer-shareholders as dividends in proportion to the amount of their shares. Decentralization is pivotal for the energy transition (Energiewende) and ecologic sustainability: a consumer who is producing his own electricity and sales its surplus, emancipates himself from the energy monopolists and their target of return on equity. Regardless of the “shareholder value” and positive profit reports, thanks to having a possibility to be actively involved in the process of energy transition, he is anyway willing to give the priority to green energy. With the trends to raise the share of renewable energy resources, decentralize energy production and win public acceptance for renewable energy projects, the time now is perfect to revive the concept of CSOP. Katarzyna Goebel is a Ph.D. student and academic researcher at the Kelso endowed chaired for Comparative Law, East European Business Law and European Legal Policy of the Europa Universität Viadrina’s faculty of economics in Frankfurt Oder (Germany). She is doing research on the topics of Consumer Stock Ownership Plans (CSOP) in the energy sector and the Polish Employee Ownership Schemes (Spółki Pracownicze). Lowitzsch, J./ Goebel, K. (2013): From consumers to energy producers. Financing decentralized energy production through capital participation of consumers by the use of so called Consumer Stock Ownership Plans (CSOPs); (German: Vom Verbraucher zum Energieproduzenten. Finanzierung dezentraler Energieproduktion unter Beteiligung von Bürgern als Konsumenten mittels sog. 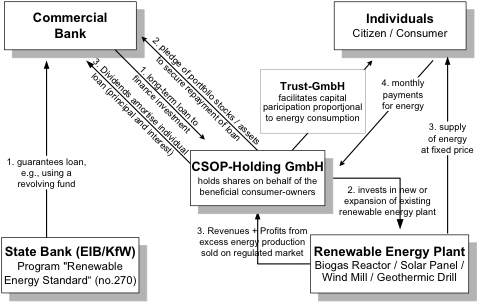 Consumer Stock Ownership Plans (CSOPs)), Zeitschrift für Neues Energierecht (ZNER), Heft 3, pp. 237-244. Valley Nitrogen Producers, Inc., A California Corporation, The First Consumer Stock Ownership Plan, 8 November 1976. Cf. : Documentation “Valley Nitrogen Producers, Inc.” of the Kelso Institute, 8. Nov. 1976. In case of Germany it is a fiduciary GmbH. Here a CSOP Holding GmbH, 100% daughter of fiduciary GmbH.